In the last few years, pulled meats have become a common sight in the fast food chiller cabinets of the country. Usually, it’s pulled pork, since that’s the main origin of the process. Pork shoulder. Slowly cooked, often with a smoking process, until you can just shred the meat with a fork. It’s a barbecue staple from the US that has become ubiquitous in all sorts of variants. Let’s ignore the fact that what supermarkets offer up under the name ‘pulled pork’ is often a poor substitute for the real thing - a neat little scam where you mix shredded pork with sausage meat and charge double what you would have been able to otherwise. I first saw the ‘pulled jackfruit’ phenomenon when I visited the Boston Tea Party in Bath. 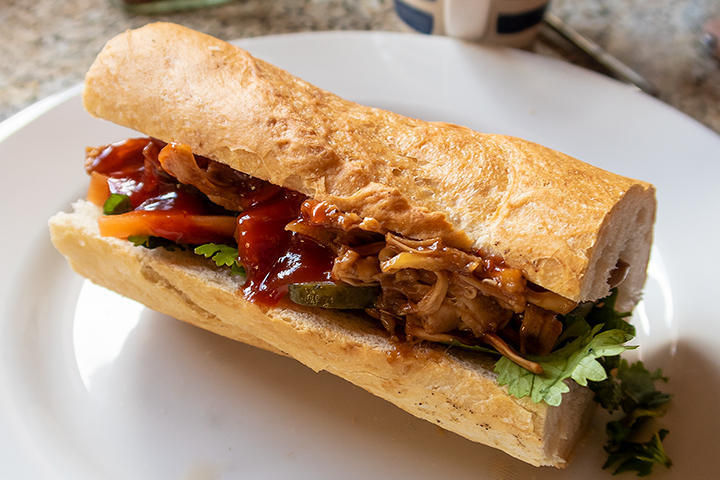 It was offered up in the form of a pulled jackfruit Banh Mi - the Vietnamese street food that has become a massively popular thing in its own right - perhaps because it offers authentic Asian cuisine in the familiar and comforting jacket of something derived from a French baguette. I tried it, and of course it was delicious - a vegan alternative to the mainstream options on the menu that would have left no vegan (or curious food explorer such as myself) feeling like a second class citizen in any way whatsoever. I decided then and there that, at some point, I would have a go at making my own version, not least because I wanted to try out cooking with jackfruit. Before we go further, it’s worth pointing out that jackfruit offers something of an illusion, and the reality is that it really is second-class food in one important regard. Yes, it can be made to look and taste as splendid as a pulled meat, the texture is right, it will absorb whatever flavours you give it - it’s delicious to eat. But it isn’t a meat substitute when it comes to nutrition. It’s a fruit, after all. It doesn’t have any kind of protein hit. That’s not the end of the world, since whatever careful attention vegans need to give to certain aspects of nutrition, getting sufficient protein isn’t really involved. No doctor in any surgery in the UK has been confronted with ailing vegans that are suffering from protein deficiency. But it’s worth bearing in mind nonetheless. There was one aspect of the Banh Mi at the Boston Tea Party I didn’t find satisfactory - and that was that the filling was simply served in a standard baguette. It was impossible to eat it as street food, since the filling would simply fly out of the centre. You ended up eating it with a knife and fork. Entirely appropriate for the setting, don’t get me wrong. But I wanted a street food version where you could get messy in a good way. It’s easier said than done. Proper Banh Mi uses a special Vietnamese baguette, one that has a crackly thin crust that gives way easily to a light crumb. In fact, the term ‘Banh Mi’ refers to this type of bread - although it’s become shorthand for the full sandwich. It’s the ideal vehicle for a filling-rich roll to be eaten on the go. A standard French baguette is a lot heavier. Tougher crust, and denser bread. I’d read somewhere that you could at least make some kind of compromise by scooping out some of the bread once you’d halved the baguette. In the absence of the real thing, that was the route that I went (of course, I made sure the removed bread didn’t go to waste). The flavour combination for the filling is a joy - a mix of barbecue-style ‘meat’, lightly pickled crunchy vegetables, mayonnaise, fresh mint and coriander, and topped with chilli sauce. I couldn’t get Asian radish to add to the pickled veg roster, so I substituted gherkins, and it worked just fine. When it came time to eat, the difference in the breads was definitely an issue. The much more resistant crust of the French baguette led to some gratuitous messiness. So maybe not food to eat on a first date, unless you can get the proper bread. That, of course, is my next mission. If you can get the proper 'Banh Mi' Vietnamese bread, ignore the 'scooping out' instruction for the baguette here. Open the tin of jackfruit and drain. Cut off the tips of the fruit (don’t go crazy, you don’t need to throw away half of the fruit) and crush them lightly with your fork to begin to reveal the ‘pulled’ fibres. Mix the garlic, ginger, ketchup, hoisin, sugar, soy sauce, rice vinegar and oil together, stirring until it’s well-mixed. Then thoroughly mix in with the jackfruit, cover with cling film and leave to marinade in the fridge - preferably overnight. Once that’s done, preheat the oven to 180ºC. Cover the carrot and the cucumber with the white wine vinegar and sugar pickling solution and leave for half an hour or so. Put the jackfruit and its marinade into an oven-safe dish and put into the oven for 15 minutes to cook. There should be some caramelising on the edges by the time it comes out. While it’s in the oven, pick the leaves of the coriander and the mint and roughly chop. Once the jackfruit is ready, begin to put together your sandwich. The meat-rich versions from street stalls in Vietnam will often have meat slices and pate at the bottom, topped by crunchy vegetables, but for this vegan version I went the other way. Begin with a light coating of mayonnaise and sprinkle over the spring onion. Top that with the chopped mint and coriander. Then a few slices of the red chilli, then the pickled carrot, cucumber and gherkin. Then spoon over a generous portion of the cooked, marinated jackfruit, and top with a line of chilli sauce. Add the baguette lid and enjoy. If you’re making two or more sandwiches, there shouldn’t be any need for much waste here. Obviously, if you’re using a pickled gherkin, you have a jar of same - these will keep for a long time in the fridge. 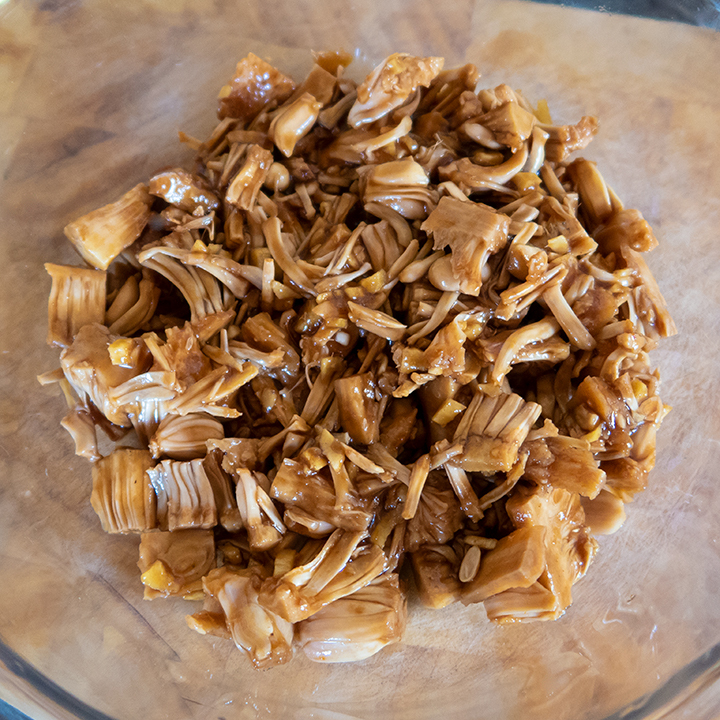 If you have more jackfruit than you need (I had about twice the quantity I needed for 2 sandwiches) you can either make it a part of your ‘leftovers’ meal for the next day - which is what I did - or you can freeze it and use within the next couple of weeks. You use a good handful of the herbs for these sandwiches, so you may not have much left over if you’ve bought a standard packet, but if you do have some, you can - as always - chop the remainder and freeze with some water in ice cube trays.